Enjoy ancient elfin forests, trek across the crater of New Zealand's only active volcano and view rare, endemic wildlife found on New Zealand's remote and rugged sub-Antarctic islands, with an unforgettable 14-day expedition voyage from Auckland to Dunedin, aboard Silver Discoverer. Departing from Auckland on 20 December 2015, Silver Discoverer ports at White Island, home to New Zealand's only active volcano, where guests have the opportunity to experience hissing fumaroles and volcanic bombs. Silver Discoverer then makes her way to Napier, renowned for its impeccable Art Deco architecture and the world's largest mainland Gannet Colony. A gorgeous day at sea carries Silver Discoverer to Chatham Island, where guests can relax on deserted beaches, explore moody landscapes and discover unique plant and bird life. Continuing her voyage, Silver Discoverer sails through New Zealand's UNESCO World Heritage recognised Sub-Antarctic Islands including: Pitt Island; Bounty Island; Enderby Island; and The Snares. 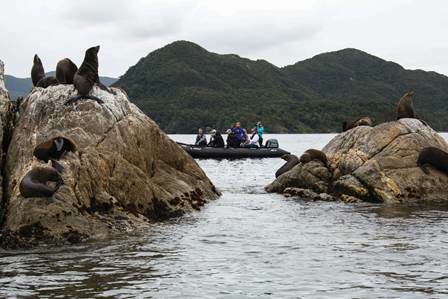 Here, guests can explore, via Zodiac, tours on land and at sea that reveal in the region's remarkable natural beauty, awe-inspiring geography, and abundant wildlife including rare sea lions and eight species of penguins such as the rare Yellow-eyed penguin. The islands offer a bounty of volcanic and glaciated geography including cave-riddled basalt cliffs, pristine sugar-sand beaches, wind-and-water-chiselled monolithic rock formations and windswept grassy headlands. Snap a portrait of huge elephant seals lolling about on the beach or witness the incredible flight forays of young albatross and the graceful soar of their elders. Marvel at endemic birdlife that includes the world's rarest cormorant, the Bounty Island Shag, the Snares Black Tomtit, and the auk-like Diving Petrel. This voyage then concludes in Dunedin, the South Island's second largest city, with guests disembarking 3 January 2016. Book this Silversea Expeditions voyage by 31 August 2015 and select a two-category suite upgrade or 50% savings on a second suite. Prices are per person starting from AU$15,650 in an Explorer Suite based on double occupancy. Silversea Expeditions' fares include: all shore and Zodiac excursions hosted by an expedition leader; all-suite accommodation with butler service; gourmet meals with menus inspired by Relais & Châteaux; complimentary wines, Champagne and spirits served throughout the ship; an outstanding expedition team of expert guides and lecturers; and all gratuities. This voyage is subject to availability. Terms and conditions apply. For more information, contact your travel professional or Silversea Cruises on +61 2 9255 0600 or 1300 306 872 or visit http://www.silversea.com/expeditions. Follow Silversea on Twitter, Facebook and the Silversea Blog.